Bouncepad, a provider of commercial displays, accessories and docking stations for tablet POS environments introduced the Bouncepad Mobi, a case and docking station designed to keep iPads and their accompanying mobile card readers securely attached, charged and sharable. The solution employs the company's magnetized, patent-pending MagTwist Connector to keep card readers connected to the case. When needed, card readers can be released with a single twist, company representatives stated. "Mobi's drop-proof, thin case is light, durable and looks good," said Shaun Bruno, director of business development, North America at Bouncepad. "It can transform iPads into mobile points of sale in seconds. Major retail and hospitality brands are already deploying it." 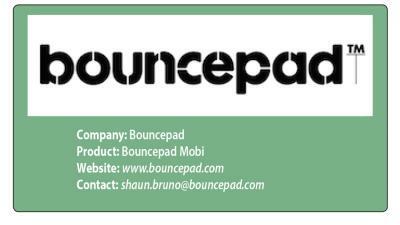 Bruno additionally noted that Bouncepad Mobi is commercial-grade and card reader agnostic. "We wanted to build a sophisticated but simple solution that incorporates everything you need in a payment device," he said. "We also wanted to make it affordable for small and midsize business owners." Bouncepad researchers and engineers routinely go "on safari" to see how merchants use mobile docking stations, Bruno said. They found some merchants using consumer devices without many features and others implementing "very industrial-looking" tablet sleds with integrated scanners. "In some cases, merchants who invested in portable in-store displays assumed their employees would use them and transform the customer experience," Bruno said. "But some of the sleds were heavy and cumbersome to use, and wire issues kept some units from being fully charged. Merchants also reported their employees were pushing back and asking store owners to return to previous, traditional in-store checkout methods." Retail and hospitality merchants are trying to integrate newer technologies to transform their brick-and-mortar environments, Bruno noted. Mobi is designed with merchants, sales associates and consumers in mind. It eliminates the use of wires by using contact charging points, and its magnetic single-twist connector can attach any card reading device. Mobi is designed to go wherever merchants and sales associates are. Its removable nylon-weave strap makes it easy to transport. The product offers a simple solution for every touchpoint and facilitates order-taking, line-busting, content-sharing and payments processing. Integrated solution: MagTwist keeps iPad and card reader together, and Mobi lasts longer by using contact points rather than cables to charge. The unique charging dock keeps the iPad and card reader powered-up, ready to take payment anywhere, anytime. Card reader agnostic: Mobi and MagTwist are compatible with iPad Pro 9.7", iPad 5 (2017), iPad 6 (2018), and iPad Air 2. They support a range of popular card readers, including iZettle, Square, PayPal Here, and SumUp. People-first design: The company leveraged its years of making enterprise tablet accessories and exceeding drop-proofing standard MIL-STD-810G, to create a low-profile, durable, commercial-grade product for staff to grab and go with everything they need to make a sale. Extended shelf life: Mobi uses contact points instead of cables to charge iPads and card readers, reducing wear and tear and increasing uptime. Comprehensive solution: Mobi includes an iPad case, dock, MagTwist connector, micro USB cable, hand-strap, power supply with U.K., U.S., and European adaptors, and an extended micro USB cable. All that is needed is an iPad and payment card reader. Sleek, elegant profile: Mobi is a commercial-grade hardware solution that is light, durable and attractive. Its aesthetic appeal makes it compatible with an array of retail and hospitality environments. Mobi's simple, durable design reflects Bouncepad's years of product design experience. Its durability and ease of use makes it ideal for high-traffic, high-transaction commercial environments, Bruno stated.